Not to be confused with Thomas Edison. First appearance "Day of the Orphan"
Latest appearance "Captain Lou Is Missing"
Edison is a friend of both Mario and Luigi and their roommate in Mario Brothers Plumbing in The Super Mario Bros. Super Show! Despite living in Mario Brothers Plumbing, Edison is rarely there, and when he is, it is usually only briefly. Edison can most commonly be found in the walls of Mario Brothers Plumbing or a manhole in the floor, which apparently leads outside into Flatbush. 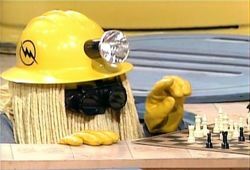 Edison has an exceptionally odd appearance, his face being mostly covered by his goggles and mop-like hair, Edison is also always shown wearing a construction helmet with a light attached to it too. In contrast to Mario and Luigi, who are plumbers, Edison is an electrician. The first appearance of Edison in The Super Mario Bros. Super Show! is in the show's second episode, "Day of the Orphan"; here, Edison acts as Luigi opponent in a game of chess, which Edison is extremely slow in playing. Eventually becoming annoyed with Edison indecisive chess playing, Luigi makes him make a move, which Luigi believes to be a bad one and counters. Edison manages to win the chess match by making his own counter to Luigi's though, and as Luigi stands dumbstruck after having lost the chess game, Edison begins to gloat. In "Magic's Magic", Edison makes a brief appearance, where he and Luigi play in a two-on-one basketball game against Mario, while the two plumbers are awaiting the arrival of Magic Johnson. Although Mario stands between Luigi and the net, Luigi is able to pass the ball to Edison, who wins the game with a slam dunk. Edison briefly appears in "Cher's Poochie", helping Mario assemble his Pizza Transformer. After being given some cables by Mario, Edison travels through his manhole and through the wall of Mario Brothers Plumbing and plugs in the cables, which are attached to the Pizza Transformer, for Mario. In "Time Out Luigi", after Mario causes a blackout in Mario Brothers Plumbing when trying to remove a cursed wristwatch from Luigi's wrist, Edison (with the light on his helmet on) bursts out of his manhole and asks Mario why the apartment had rumbled a few seconds ago and why the lights were out. In "Captain Lou Is Missing", Edison has a very minor role as a member of the search team that Mario, Luigi and Cyndi Lauper organize at Mario Brothers Plumbing. Edison is named after the famed inventor Thomas Edison, who is best known for having invented the incandescent lamp or lightbulb. He may also be named after Con Ed, the power company for most of New York. This page was last edited on March 26, 2019, at 17:29.